Papers are being sought for presentation at a conference entitled The Eichmann Trial at 50 and/or for publication in a volume to be published in an edited volume following the conference. Papers on any topic related to the proceedings, by Ph.D. candidates as well as more established scholars, are welcome. The law school's Asia Pacific Centre for Military Law is sponsoring the October conference. It will be the 3d of 4 symposia comprising the Australian Research Council-funded project “Invoking Humanity: A History of War Crimes Trials.” Organizers are our colleagues Kevin Jon Heller and Gerry Simpson. On 11 April 1961, the trial of Adolf Eichmann began in the District Court of Jerusalem. The trial was broadcast internationally, the first televised trial in the history of television, drawing millions of viewers around the world. Eight months later, after the testimony of nearly 100 witnesses had changed perceptions of the Holocaust forever, the court convicted Eichmann and sentenced him to death. Five months after that, Eichmann was hanged and his ashes were scattered at sea, bringing to a close one of the most important trials of the 20th century. 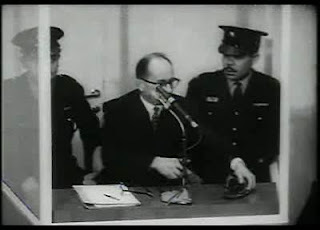 2011 marks the 50th anniversary of the Eichmann trial. The trial has had a profound impact on a variety of academic disciplines – law, philosophy, literary theory, political science, and history, to name only a few – yet scholars in those disciplines have rarely interacted with each other. The goal of symposium is to bridge that gap by bringing together scholars who have nothing in common other than a shared interest in the trial. Symposium participants will have to self-fund, although meals will be provided during the conference. Abstracts of between 300 and 500 words, plus a short CV, should be e-mailed no later than June 15, 2011, to Professor Heller, c/o James Ellis at j.ellis@student.unimelb.edu.au. Questions about the symposium should be directed to Professor Heller, at kheller@unimelb.edu.au.